Julie Everson, recipient of the 2017 Veritas House Carer of the Year Award. This week is Foster Care Week and Veritas House celebrated with a Carer Awards ceremony recognising the significant contribution local foster carers make to the lives of vulnerable children and young people. The ceremony featured the inaugural presentation of the Carer of the Year Award to Julie Everson, an exceptional carer who displays the Veritas House organisational values of compassion, innovation, inclusion, individualised care, cultural sensitivity, fairness and honesty. Julie has been a carer with Veritas House for almost 3 years and cared for five children and young people, as well as providing respite care to numerous others. A loving, warm and accepting carer, Julie makes every child that comes into her care feel included as part of her family, and incorporates anything that is special or significant to the children into her own life, including attending cultural events with Aboriginal children in her care, ensuring they continue to remain connected to their culture. “I became a foster carer because I wanted to give the kids who don’t have a loving home the home that they deserve,” said Julie. In addition to the Carer of the Year Award, Veritas also presented 16 foster carers with awards acknowledging their dedication and contribution to children and young people over more than 10 years’ service as carers. 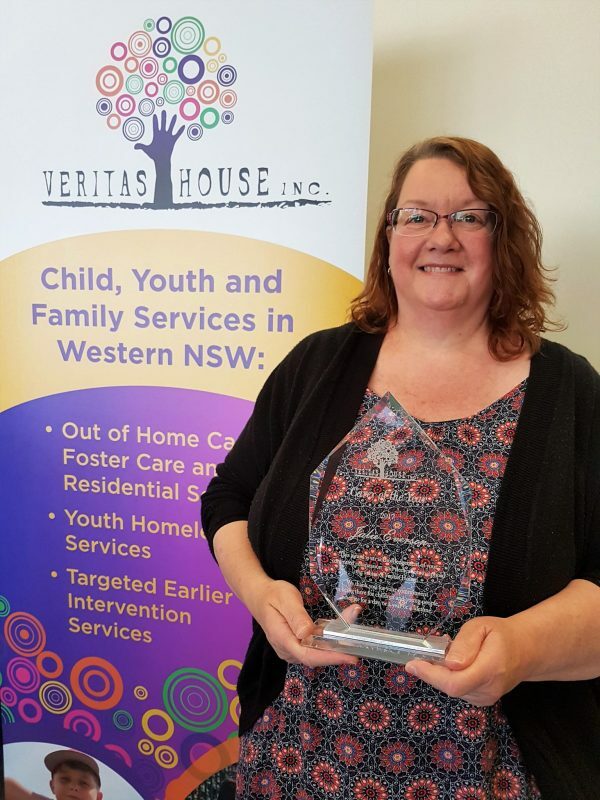 According to Veritas House Operations Manager – Permanency Support, Jacqueline Ashleigh, the awards acknowledged the significant contribution local foster carers make in providing a safe and supportive home environment for children in out-of-home care. “Our foster carers play a critical role in assisting children and young people in their care to grow and develop in a happy and healthy way and our awards ceremony was an opportunity to honour and celebrate the contribution they make to our community,” said Ms Ashleigh. “To have so many of our foster carers reach the milestone of ten years as carers is also significant and demonstrates just how rewarding the role can be,” she said. However despite this, Veritas House remains in urgent need of new foster carers, with the number of children and young people entering Out of Home Care in NSW growing from 10,000 in 2006 to 18,000 in 2016. A wide range of carers are needed including respite – which can be as little as a weekend a month; emergency; long term; extended family or kin; guardianship and adoptive parents.